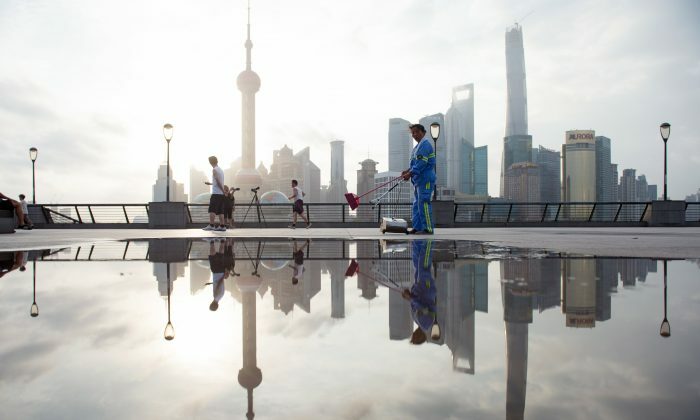 China is a country of extremes, especially regarding economic forecasts. There are those who think “China will take over the world” with its technocratic central planning. Then there are those who say its debt bubble is so gigantic, the economy will crash and burn. The truth probably lies somewhere in the middle. And it looks like we are getting closer to knowing the truth. Official GDP growth is, of course, on track at 6.6 percent for the year 2018, stellar among industrial and even emerging economies. But nobody believes these figures, even though they are the worst since 1990. 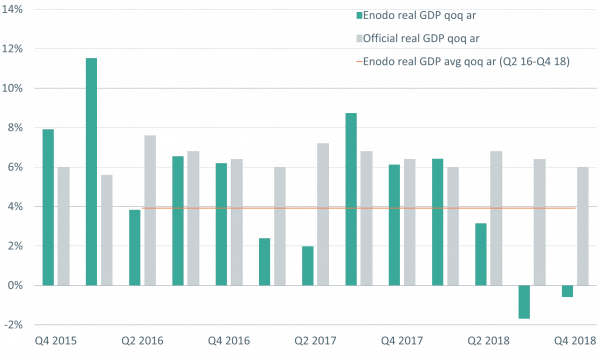 “Real GDP fell by 1.7 percent and 0.6 percent in Q3 and Q4 respectively compared with the official figures showing growth of 6.4 percent and 6 percent,” Enodo Economics chief economist Diana Choyleva wrote in a note to clients about annualized growth during the past two quarters of 2018. According to Choyleva, China is experiencing an unofficial recession. While this doesn’t mean the crash-and-burn scenario is unavoidable, the flurry of official and unofficial economic indicators flashing red make the “take over the world” scenario quite unbelievable for the intermediate future. No matter which official indicator you look at, the Chinese economy is in decline. Retail sales growth is barely above 5 percent, the lowest level since 2003, with automobile sales crashing 13 percent. Total imports in U.S. dollar terms are down 7.6 percent in December of 2018 as compared to the year before. 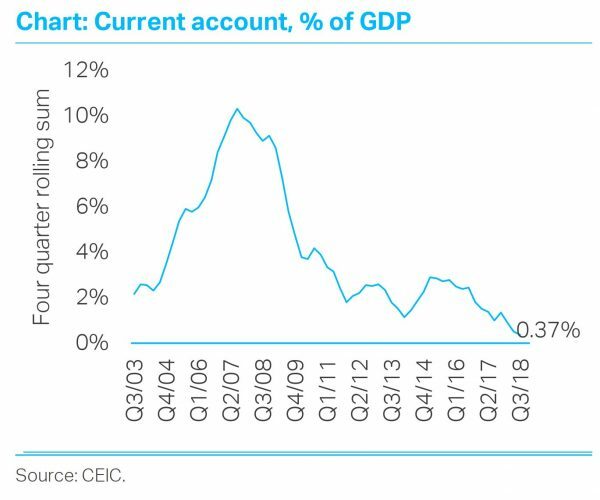 China’s current account balance, or the amount of exports over imports and one of the main drivers of Chinese growth over the decades, is down to 0.37 percent of GDP, from 10 percent in 2008. With exports down 4 percent, the analysts at Oxford Economics also are sounding the alarm bells. The CBB also warned that with manufacturing broadly down, services and consumers aren’t picking up the slack, as borne out by official data. 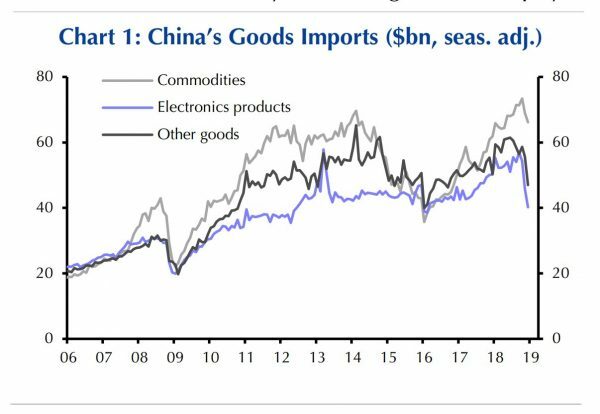 Given this material slowdown in trade, one may assume that it’s the U.S. retaliation against unfair Chinese practices that’s causing the troubles in China’s economy. The CBB also reports that only 18 percent of companies operating in the trade-heavy southern province of Guangdong showed an increase in export orders in the fourth quarter, down from 65 percent in the third quarter of 2018. Trade with countries from Asia slowed much more than bilateral trade with the United States and the Chinese domestic problems, such as a slowdown in retail sales, can’t be explained by a limited amount of tariffs. The financing went into building trains, roads, airports, apartments, shipyards—anything that can be built. And while some of the stuff is undoubtedly useful, a lot of it is not. If it’s not useful or sustainable, it won’t generate the returns necessary to service said debt. This problem could have been nipped in the bud, but Chinese central planners wanted ever more steel mills and high-speed trains, and to push back the day of reckoning when most of the unprofitable companies would go bankrupt. So, to keep the gravy train running, more debt had to be issued to build more stuff. Now, the debt growth has also come to a halt, which is most likely the root cause of the massive slowdown. Official broad credit growth has slowed to around 10 percent, the lowest in a decade. Within the broader debt system, the shadow banking system of trust loans, bankers acceptances, and wealth-management products is deep into negative growth territory. This divergence makes sense as fixed-asset investment rose 5.9 percent in December from a year earlier, bucking the trend of other declining indicators. According to CBB, it was state and larger firms that borrowed the most, channeling it into construction activity, which is the easiest lever for the central planners to manipulate. Floor space under construction rose 5 percent in December, according to official figures, while there are still about 20 months of inventory left to be sold, according to Capital Economics estimates. After the new year, the PBOC easing became less clandestine as the central planners in the Chinese regime are getting desperate. After lowering the amount of money banks have to hold on reserve in late 2018, the PBOC started a full-blown Quantitative Easing (QE) scheme at the beginning of 2019. Although final numbers aren’t known, the program allows banks to swap near-worthless collateral for central bank assets, thus reducing the risks on their balance sheet and freeing up reserves for more lending. His assessment isn’t too far off the mark, as the “actual situation” is rapidly going downhill. This can prevent a full-blown collapse, but since an inordinate amount of capital and labor has been wasted on technocratic central planning projects, there also won’t be any growth. So China will most likely resemble the other debt basket case: Japan, except that Japan managed to lift the whole population into prosperity and not just about half. So much for the achievements of the Communist Party and the “Chinese model” of statism and central planning. China’s fixed asset investment decelerated further in August, as the country braces for additional tariffs amid the U.S.-China trade war.